Some parts of the vehicle should not be replaced immediately in case of failure. The water pump is not one of these parts. Due to the important role that the pump plays in engine cooling, the consequences are fast if they stop working, including a potential engine failure. Replacing a faulty water pump is not a fast job, but it will save you the worst job of replacing your engine. The water pump moves the coolant through the radiator and around the engine to dissipate heat. Fast-moving, closely connected metal parts generate a lot of friction and thus heat. Too much heat, and as a result, you get components that are deformed, melted, molten, broken, or structurally threatened. 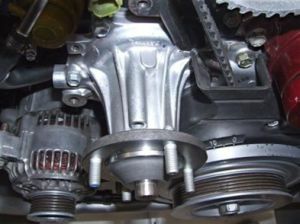 The water pump is usually driven by a pulley. Inside is a turbine that keeps the system in circulation. A telltale sign of a water pump that soon fails is a noticeable leak of coolant to the front of the vehicle. If the car is left overnight and you notice a puddle on the orange or green ground (depending on the coolant used), suspect the pump. Slow leakage over time will cause a build-up of dirt around the pump. Look for traces of coolant coming down from the pump or some sort of gel coolant deposit on the outside. You may also notice a lot of rust around the pump and, if you look closely, pitting (corrosion that creates small holes in the metal) or cavitations (forming cavities in a liquid) on the surface of the pump mounting. All this indicates a slow leak. Although this will not cause an immediate failure, it will create a lack of coolant (which is bad enough) and will allow the lubrication to protect the moving parts inside the pump from escaping. A loosed accessory belt will produce a groaning sound that increases with acceleration. The solution to this problem could be as simple as tightening the belt or replacing the tensioner. If you hear a squeaking or rumbling sound in the front of the engine, it indicates a bad ride. There are other bearings in the front of the engine that may fail, but in any case, you must immediately have a mechanic to confirm and fix the problem. If the pump has failed, the engine overheats. If you have not noticed any other signs of impending failure, keep this in mind. When the "Low Coolant" light comes on, add coolant as soon as possible and check for a large leak. If the temperature gauge exceeds the normal value or a temperature gauge illuminates, stop and call a tow truck. If smoke or steam comes out of your radiator or under the bonnet, your engine is too hot and has probably suffered a lot of damage. Stop immediately and call for help. Wait for the engine to cool before starting the search because it is a hot coolant and possibly other unexpected hazards. Since it is located at the front of the engine behind the fan, access to a pump with poor water can sometimes require considerable disassembly. It's really painful that a component has been replaced, but it's worth it. Do yourself a favour and watch out for the warning signs before it's too late for your engine.